The Mullum chapter of the NRUO preparing for their performance at the Uke Mullum Night 27 March 2014 (Jan absent) Maxine – age 7 – present! Thanks for you efforts everybody. The Mullumbimby chapter of the Northern Rivers Uke Orchestra rehearsing two tunes for their next performance at Uke Mullum on Thursday 27 March. Well done all. Good focus and great enthusiasm and attitude. Keep up the good work. Looking forward to the final verse for Randy, by Brad Green. Great job everyone!! For the next Uke Mullum night, The Mullum chapter will be performing this tune. A re-working of ‘Walk On The Wild Side’ by Brad Green, entitled Randy The Rooster. The video above is a suggested strum pattern. Well, you and I both know I haven’t left it alone for one day, though this is a quick announcement: Bangalow began last week, Wed 22 back in the church on Market Street, though is not on this week. The 26th Annual BREAKFAST IN THE PARK was held in Banner Park, Brunswick Heads (in the Housie Tent) on Australia Day SUNDAY 26TH JANUARY 2014. It was a wonderful spirited morning with The combined Service Clubs (Rotary Lions and Quota) of the Brunswick Valley served a delicious BBQ Breakfast with bottomless cups of coffee and tea for just $4.00 per person from 7.30 am until 9.00am. Looking forward to a great uke-ified 2014. Stu is in need of a little holiday, so there will be a break from all activity over the Christmas period. Bangalow has two weeks to go; Wed 4 and 11 of Dec then will resume Wed 29 Jan. Ocean Shores and Mullumbimby will resume Mon 27 Jan. Ocean Shores is on break now and Mullumbimby’s last meeting is Monday 16 Dec. Thanks for your support in 2013! If in doubt please check the calender here. 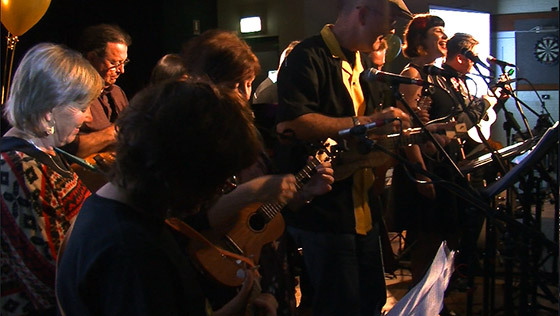 Mullum Uke Club at the Mullum Ex-services club has been in existence since June 2012. It has been like the petri dish for the Northern Rivers Uke experiment… where the policy and format has been moulded to create the most enjoyable and fulfilling outcome for a bunch of ukesters. Now, after many format changes, we have settle on becoming a performance group like the Bangalow chapter. Therefore our aim is to learn 3 songs per month (may end up being two), with out music so they can be performed as a troupe or orchestra at the monthly Uke Night at the Courthouse hotel. The first performance of a 5 piece group is this Thursday night, 28th of November 2013.